Staff file photo: Supporters and critics of nuclear power squared off Tuesday night at a public hearing about the future of the Bellefonte Nuclear Plant. With the clock ticking down to TVA's board consideration next week of the $4 billion to $5 billion completion of Bellefonte Nuclear Plant, the Southern Alliance for Clean Energy unveiled a new report Tuesday alleging "seven major factors" why the project should not go forward. 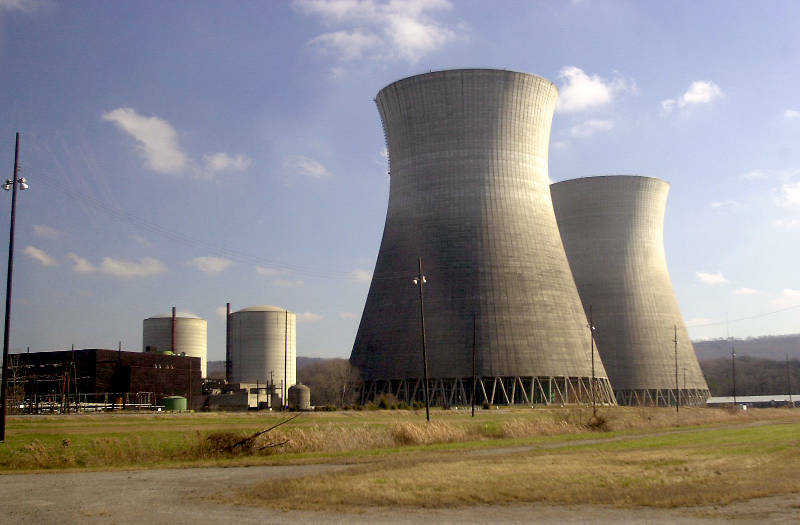 Calling Bellefonte "TVA's bad nuclear bet," the alliance's executive director, Stephen Smith, said the 37-year-old, half-finished and cannibalized nuclear plant has document problems that make it "too risky" for safety and fiscal reasons. "We're not convinced Bellefonte is salvageable," he said, noting a potential for cracking in foundations and reactor containment areas similar to cracks discovered in recent years in a nuclear plant in Florida. "These are [documentation] issues that TVA may have with regulators that will be extremely costly, if not insurmountable," Smith said. "And with TVA's debt ceiling, they [TVA] don't have the wiggle room they did in the '70s to throw good money after bad." He and Fairewinds Associates consultant Arnold Gundersen said Nuclear Regulatory Commission inspections also show water damage to the foundation of Bellefonte, caused by TVA turning off sump pumps when the plant was mothballed. Their report also details NRC's report about the snap of a tendon anchor in the reactor containment vessel at Bellefonte. A similar problem so far has proven to be difficult to fix at the Florida plant, where repair efforts actually caused more cracks. Gundersen said TVA has not checked sufficiently for cracks at Bellefonte. TVA nuclear officials and Bellefonte's site engineering manager insist the plant, which already has cost $4.7 billion, is safe. And they said there are mistakes in the assumptions of the alliance's report. Wally Justice, Bellefonte site engineering manager, said TVA has used all known available technologies to check for containment cracks and foundation problems. Those technologies include visual inspection, core drilling, as well as ultrasound and acoustic sounding. "The concrete in nuclear structures is high-stress concrete, similar to that in a lot of dams. It's designed for a life of close to 100 years. We believe ours has life much longer than 100 years," Justice said. Ray Golden, TVA's nuclear spokesman, said the Florida plant's problems were compounded when a steam generator replacement effort required a hole to be cut in the containment wall. TVA is replacing Bellefonte's steam generators that were sold for scrap, but Bellefonte has a hatch large enough for the generators, so no hole must be cut in the containment wall. Ray Hruby, Bellefonte project director, said Bellefonte's snapped tendon came loose from its anchor coupling because the grease used in it was somehow contaminated with sulfites - a corrosive material. He said TVA tested all other grease in all other tendon couplings and found no contamination. Nuclear regulators documented the tests, he said. Bellefonte's renewed construction is expected to be on the Aug. 18 TVA board agenda. Tom Kilgore, TVA president and CEO, has said the nation's largest public utility will seek the board's approval to finish the 1,260-megawatt, Babcock and Wilcox-designed reactor. It would power about 750,000 homes and become TVA's eighth reactor on the banks of the Tennessee River. Even if the board approves the reactor's completion, TVA's policy is that construction would not begin until work is finished at a new Watts Bar reactor. On Wednesday, TVA announced that the Watts Bar Unit 2 reactor near Spring City, Tenn., is perhaps as much as a year behind schedule and will not be done until sometime in 2013. Smith said the alliance doesn't favor TVA ceasing all nuclear operations but does favor the utility adopting a more aggressive energy efficiency and conservation program with renewable energy sources such as solar and wind. Contact Pam Sohn at psohn@timesfreepress.com or 423-757-6346.